I am writing to thank the Beacon for your “congratulatory shout out” to my husband and I on the occasion of our 50th wedding anniversary in September. It was included in the “remembering 50 years ago” section. My friend and long time resident of Andover, Frie Scott, is an avid reader of the Beacon though she now resides in Massachusetts; she shared the article with me. I grew up in Andover and graduated from the high school, then still located in the town, in 1962. I remember Andover as a quiet little village, mostly known for Proctor Academy and Route 4, which was the “pass through” people travelled to get from Concord to Hanover, before the building of Route 89. 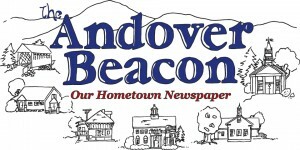 From reading the Beacon, I now recognize that Andover is a vibrant, busy community of many young families offering a myriad of opportunities to socialize and get involved. It has been a pleasure learning about Andover’s growth, and reading the “50 years ago” has brought back so many memories. Keep up your efforts and again, thank you for the recognition.